Ventral tegmental area (VTA) dopamine (DA) neurons perform diverse functions in motivation and cognition, but their precise roles in addiction-related behaviors are still debated. Here, we targeted VTA DA neurons for bidirectional chemogenetic modulation during specific tests of cocaine reinforcement, demand, and relapse-related behaviors in male rats, querying the roles of DA neuron inhibitory and excitatory G-protein signaling in these processes. Designer receptor stimulation of Gq signaling, but not Gs signaling, in DA neurons enhanced cocaine seeking via functionally distinct projections to forebrain limbic regions. In contrast, engaging inhibitory Gi/o signaling in DA neurons blunted the reinforcing and priming effects of cocaine, reduced stress-potentiated reinstatement, and altered behavioral strategies for cocaine seeking and taking. Results demonstrate that DA neurons play several distinct roles in cocaine seeking, depending on behavioral context, G-protein-signaling cascades, and DA neuron efferent targets, highlighting their multifaceted roles in addiction. SIGNIFICANCE STATEMENT G-protein-coupled receptors are crucial modulators of ventral tegmental area (VTA) dopamine neuron activity, but how this metabotropic signaling impacts the complex roles of dopamine in reward and addiction is poorly understood. Here, we bidirectionally modulate dopamine neuron G-protein signaling with DREADDs (designer receptors exclusively activated by designer drugs) during a variety of cocaine-seeking behaviors, revealing nuanced, pathway-specific roles in cocaine reward, effortful seeking, and relapse-like behaviors. Gq and Gs stimulation activated dopamine neurons, but only Gq stimulation robustly enhanced cocaine seeking. Gi/o inhibitory signaling reduced some, but not all, types of cocaine seeking. Results show that VTA dopamine neurons modulate numerous distinct aspects of cocaine addiction- and relapse-related behaviors, and point to potential new approaches for intervening in these processes to treat addiction. Ventral tegmental area (VTA) is a crucial node in mesolimbic circuits of reward, and the 50–70% of neurons there that express dopamine (DA; Dobi et al., 2010) play diverse and long-debated roles in natural and drug reward-related behaviors. The activity of these neurons is extensively regulated by G-protein-coupled receptors (GPCRs), and several GPCRs are currently under investigation as therapeutic targets for the treatment (Tx) of cocaine use disorders. Nevertheless, the specific roles for DA neurons in cocaine reinforcement, effortful seeking, or reinstatement, and how GPCR signaling modulates these, remain unclear. Studies using pharmacological manipulation of DA receptor signaling, lesions of DAergic regions and their forebrain targets, or measurement of DA neuron firing or nucleus accumbens (NAc) DA release show clear roles for DA circuits in reward salience, learning, valuation, and seeking (Berridge and Robinson, 1998; Everitt et al., 2008; Bromberg-Martin et al., 2010; Lüscher and Malenka, 2011; Lammel et al., 2014a; Keiflin and Janak, 2015; Pignatelli and Bonci, 2015; Hamid et al., 2016; Schultz, 2016; Saunders et al., 2018). VTA DA neuron-specific optogenetic stimulation experiments confirm reinforcing and conditioned motivation roles for DA neurons; conversely, optogenetic inhibition of VTA DA neurons is behaviorally avoided (Tsai et al., 2009; Adamantidis et al., 2011; Witten et al., 2011; Steinberg et al., 2013; Berrios et al., 2016). Specific dissections of VTA DA neuron behavioral functions also reveal marked functional heterogeneity, relating in part to efferent projection target and cotransmitter activity (Floresco and Magyar, 2006; Chaudhury et al., 2013; Lammel et al., 2014b; Trudeau et al., 2014; Barker et al., 2016; Tritsch et al., 2016; Edwards et al., 2017; Saunders et al., 2018). However, the roles for DA neurons in cocaine self-administration or relapse-like behaviors are poorly understood. Considering that the vast majority of pharmacotherapies for psychiatric disorders act via modulation of GPCRs, it is imperative that we also understand how these receptors operate in vivo in defined cells, such as VTA DA neurons, to modify behavior. A great deal is known about the signaling and behavioral functions of endogenous GPCRs in DA neurons and circuits (Hearing et al., 2012; Meye et al., 2012, 2014; Gantz et al., 2013; Loweth et al., 2013; Fields and Margolis, 2015; Johnson and Lovinger, 2016; Wenzel and Cheer, 2018), but parsing the effects of pharmacological manipulations from those of endogenous receptor activity in vivo is challenging. Here, we use synthetic designer receptors exclusively activated by designer drugs (DREADDs) to artificially engage GPCR signaling “on demand,” independent of activity at endogenous receptors, and specifically in VTA DA neurons. By directly (but not necessarily physiologically) activating these signaling cascades within neurons of interest using DREADDs, we can isolate their involvement in producing motivated behaviors related to addiction. Here, we used this chemogenetic approach to probe the roles of VTA DA neurons, their main forebrain targets, and their GPCR-signaling mechanisms in cocaine intake and relapse. Taking advantage of the transient, reversible modulation offered by DREADDs to repeatedly and selectively manipulate DA neurons/efferents during cocaine-seeking behaviors, we demonstrate that engaging Gi and Gq (but not Gs) signaling in VTA DA neurons causes task-dependent changes in drug seeking and cognition, depending on whether behavior was motivated by the reinforcing or priming effects of cocaine, cocaine-paired cues, or stress-like states. Male, hemizygous tyrosine hydroxylase (TH)::Cre transgenic rats (Witten et al., 2011; Mahler et al., 2014) and wild-type (WT) littermates (n = 134) were bred at Medical University of South Carolina (MUSC), University of California, Irvine (UCI), or Drexel University, from founders (mated to wild-type partners) provided by K. Deisseroth (Stanford University). They were housed in tub cages under a reverse 12 h light/dark cycle, with free access to food and water at all times (initial surgical weight, 250–400 g). All procedures were approved by the MUSC, UCI, or Drexel University institutional animal care and use committees. Immediately after catheter implantation, 1 μl/hemisphere titer-matched adeno-associated virus 2 (AAV2) vectors containing a double-floxed, inverted open reading frame (DIO) sequence for the mCherry-tagged hM4Di (Gi-coupled), hM3Dq (Gq-coupled), or rM3Ds (Gs-coupled) DREADDs, or mCherry control (hSyn-DIO-hM4Di-mCherry, hSyn-DIO-hM3Dq-mCherry, hSyn-DIO-rM3Ds-mCherry, hSyn-DIO-mCherry: University of North Carolina Vector Core or AddGene; key reinstatement and economic demand results were replicated with vectors from both sources) was pressure injected via Hamilton syringe (28 ga) or glass micropipette bilaterally into the ventromedial midbrain over 2 min (1 μl retracted 5 min later) causing DREADD expression selectively in TH neurons of VTA (coordinates are relative to bregma: anteroposterior (AP), −5.5; ML, ±0.8; DV, −8.15). WT rats were injected with one of the same DIO vectors (Gq, n = 9; Gs, n = 8; Gi, n = 8), although no expression was observed in any rat with vectors from either source. More than 4 weeks was allowed between virus injection and first clozapine N-oxide (CNO) administration, during which time cocaine self-administration and extinction training occurred. Intravenous catheter and intracranial surgeries have been described in detail previously (Mahler et al., 2013, 2014). Chronic jugular intravenous catheters were implanted exiting the back, then intracranial virus was injected stereotaxically in the same surgery. Cranial cannulae were implanted in NAc, medial prefrontal cortex (mPFC), or basolateral amygdala (BLA) in a separate surgery after initial (8 d) cocaine self-administration training (∼3 weeks after the first surgery). After recovery, they completed 2 remaining self-administration days, followed by extinction, reinstatement tests, and food intake tests. Cocaine HCl was dissolved in 0.9% saline (intravenous self-administration, 3.33 mg/ml; intravenous behavioral economic (BE) self-administration, 2.73 mg/ml; cocaine prime, 10 mg/ml). CNO was obtained from Tocris Bioscience or NIMH/NIDA Drug Supply Programs), dissolved in 5% DMSO in saline (0, 1, 10 mg/ml), and injected intraperitoneally 30 min before behavioral tests. Yohimbine HCl (YOH; Sigma-Aldrich) was dissolved in water (2.5 mg/ml) and injected intraperitoneally immediately after vehicle (Veh)/CNO injection. For intracranial injection, CNO was dissolved in 0.5% DMSO in artificial CSF (ACSF; 1 mm/0.3 μl; total dose, ∼100 ng/hemisphere) and microinjected 5 min before behavior. The behavioral protocol used in these experiments is shown in Figure 1. Operant testing was conducted in Med Associates chambers. Rats received initial cocaine self-administration training until they self-administered >10 infusions/daily 2 h session for 10 d. Active lever presses yielded a 3.6 s infusion of 0.2 mg/50 μl, i.v., cocaine and a concurrent tone/light cue, followed by a 20 s timeout period. Presses on the inactive lever had no consequences. Following self-administration training, rats received at least seven 2 h duration extinction training sessions, when lever presses yielded neither cues nor cocaine, which continued until the criterion was met (<25 active lever presses for 2 d). Behavioral testing timeline: following surgery and recovery, Gq-, Gs-, Gi-DREADD rats and WT controls were trained to self-administer cocaine plus a tone/light cue over 10 daily 2 h sessions, then extinguished over more than seven additional sessions. In a repeated-measures design, we examined the effects of counterbalanced injections of CNO (0, 1, 10 mg/kg) on cocaine seeking in a CNO-induced reinstatement test (no cues/cocaine), during reinstatement elicited by cocaine cues, cocaine priming injection, or yohimbine (YOH) plus cocaine cues, on a test of cocaine behavioral economic (BE) demand, and on locomotor activity in a habituated environment. Following extinction training, all rats underwent a series of 2 h reinstatement tests, each separated by >2 d of re-extinction. Each reinstatement modality was tested after counterbalanced vehicle/CNO (1/10 mg/kg) injections before moving on to the next reinstatement modality. The order of reinstatement modalities was fixed to minimize potential carryover effects of one type of reinstatement (e.g., yohimbine or cocaine prime) on others (e.g., cue reinstatement; Mahler et al., 2013). For cued reinstatement tests (all rats tested, n = 36), active lever presses yielded cocaine-associated 3.6-s-duration cue presentations (followed by a 20 s timeout period signaled by extinguishing the houselight), but no cocaine. Inactive lever presses were recorded, but were inconsequential. For the CNO-induced reinstatement test (n = 34; 2 rats in an initial pilot group were not tested on this behavior), lever presses yielded neither cocaine nor cocaine cues, but were recorded. For primed reinstatement tests (n = 34; 2 rats were removed from this and subsequent tests due to infection-related illness), cocaine (10 mg/kg, i.p.) was given immediately before the test, and lever presses were also inconsequential. For yohimbine plus cue reinstatement tests, rats (n = 29; 5 rats in the initial pilot cohorts were not tested, and 2 rats were excluded for illness) received the pharmacological stressor yohimbine (2.5 mg/kg, i.p. ; 5 min before CNO/Veh, 35 min before test), and active lever presses yielded delivery of previously cocaine-associated cues, followed by a 20 s signaled timeout. After each reinstatement test, rats were given more than two extinction retraining sessions until they returned to the extinction criterion. Across species, motivation for a reward can be measured via analysis of demand elasticity or the sensitivity of reward consumption to increasing price (Bickel et al., 1990; Hursh, 1993). The within-session cocaine BE paradigm is a useful behavioral tool for examining the effects of acute neural manipulations in rats on economic demand (España et al., 2010; Oleson et al., 2011; Bentzley et al., 2013, 2014). Rats (n = 36) were trained to self-administer cocaine under a within-session cocaine demand protocol, as described previously (España et al., 2010; Oleson et al., 2011; Bentzley et al., 2013). On an fixed ratio 1 (FR1) schedule, rats self-administered cocaine at doses that decreased in 10 min blocks over the 110 min session (383.5, 215.6, 121.3, 68.2, 38.3, 21.6, 12.1, 6.8, 3.8, 2.2, and 1.2 μg per infusion), requiring increasing effort across the session to maintain the preferred brain cocaine concentration. After every session, a demand curve was fit to the consumption data from each rat using an exponential demand equation (Hursh, 1993; Bentzley et al., 2013) to determine economic demand for cocaine as previously described (Bentzley et al., 2013). The values of α and Q0 in Equation 1 were calculated using a novel approach that we developed specifically for data acquired via the within-session cocaine BE paradigm used herein (Bentzley et al., 2013). This approach was set to model cocaine demand that occurs when brain cocaine concentration is stable, such that a rapidly changing brain cocaine concentration does not influence the measures of cocaine demand. See the study by Bentzley et al. (2013) for a complete discussion for the rationale and details of this approach. Briefly, a custom Excel (Microsoft) macro was used to determine and remove data points associated with rapidly changing brain cocaine concentrations over time. A demand curve computed using the exponential demand equation (Eq. 1) was then fit to the remaining cocaine consumption data (Hursh and Silberberg, 2008). The values α and Q0 in Equation 1 were then determined via an automated, iterative process performed by a custom Excel macro, because Equation 1 cannot be solved algebraically. The macro manipulated the values of α and Q0 to minimize the residual sum of squares (i.e., the square of the difference between the experimentally measured demand and the demand predicted by Equation 1 was found for each price and then summed across all prices). The parameter k in Equation 1 represents the range of the consumption data in Loge units and was held constant at a value of 7.368 (3.2 in Log10 units) across all animals. This value of k was chosen based on the maximum observed range of consumption. Using this behavioral economic approach, effects of neural manipulations on (1) preferred cocaine blood levels under low-effort conditions (free consumption; Q0), and (2) the sensitivity of demand to price (demand elasticity; α) can be derived from data in a single session. Rats were trained for a minimum of 5 d, until <25% variability of the α parameter in the last three sessions. Values for α and Q0 were calculated as a percentage of stable performance on the prior 3 drug-free training days. Most rats were previously tested on self-administration, extinction, and reinstatement (Gq, n = 6; Gs, n = 3; Gi, n = 8; WT, n = 8), although an initial cohort did not undergo demand analysis (Gs, n = 8), or lost catheter patency during extinction/reinstatement testing (Gi, n = 1; Gq, n = 1). Therefore, additional rats were added to each DREADD group, to replicate the effects in rats without prior extinction/reinstatement experience (Gi, n = 6; Gq, n = 1; Gs, n = 4). Following self-administration and reinstatement testing, a subset of rats previously tested as described above (Gq, n = 6; Gs, n = 6; Gi, n = 5; WT, n = 7) were habituated for two daily 2 h sessions to a locomotor testing chamber (40 × 40 × 30 cm), with clear plastic sides, corncob bedding, and photobeam arrays to measure horizontal and vertical activity, then tested for CNO/Veh effects in 2 h sessions on separate days. Effects of intracranial vehicle or CNO (1 mM) injections into mPFC (n = 10, 0.3 μl), NAc (n = 11, 0.5 μl), or BLA (n = 7, 0.5 μl) on spontaneous chow intake were measured on two 2 h sessions held 48 h apart, following self-administration, extinction, and reinstatement tests (four prior microinjections before testing food intake). They were first habituated for two 2 h sessions to the same clear plastic tub cage with corncob bedding, preweighed chow on the floor, and a water bottle. Chow intake was quantified by comparing food weight before and after these sessions. Colocalization of mCherry and TH in VTA. To confirm DREADD expression in VTA DA neurons, costaining for mCherry and TH was performed on VTA sections from cocaine-experienced rats behaviorally tested above (n = 30). The 40 μm sections were blocked in 3% normal donkey serum (NDS), then incubated in rabbit anti DS Red to label mCherry (1:1000; catalog #632496, Clontech) and mouse anti TH (1:1000; catalog #22941, Immunostar) for 16 h at room temperature (RT). Sections were washed, then incubated in Alexa Fluor donkey anti-rabbit 488 and donkey anti-mouse 594 antibodies (both 1:500; Jackson ImmunoResearch) for 4 h. Sections were coverslipped and imaged on a Leica epifluorescent microscope with StereoInvestigator software (MicroBrightfield). Images of the entire VTA and substantia nigra (SN) were obtained from three planes in the z-axis at 10× magnification, stitched together using the StereoInvestigator virtual slice module, and collapsed into a flat maximum projection image of ventral midbrain for quantification by an observer blind to experimental condition. The percentage of mCherry neurons with or without somatic TH expression (to determine specificity), and TH(+) neurons with or without coexpression of mCherry (to determine penetrance), were quantified bilaterally within the entire VTA and SN on one slice per rat (5.3 to 5.6 mm caudal of bregma; Gq, n = 8; Gs, n = 8; Gi, n = 8; mCherry, n = 6). Fos expression in VTA DA neurons. To verify DREADD stimulation of VTA DA neurons, we examined Fos expression in VTA TH(+) neurons in a subset of behaviorally tested rats (Gq Veh/10 CNO, n = 2/3; Gs, n = 2/2; Gi, n = 2/2). Animals were given vehicle or CNO intraperitoneally, left undisturbed in their home cages for 180 min, then perfused. Coronal 40 μm sections were blocked in 3% normal donkey serum, then incubated in rabbit anti c-Fos (1:1000; ABE457, Millipore) and mouse anti-TH for 16 h at RT in phosphate buffered saline (0.01 M) with Triton X (0.3%). Sections were washed, then incubated in Alexa Fluor donkey anti-rabbit 488 and donkey anti-mouse 594 (1:500 of each; catalog #715585150, JacksonImmunoresearch) for 4 h. Sections were imaged at 20×, and Fos was quantified in TH(+) and TH(−) cells in three bilateral sections/rat at approximately −5.2, −5.5, and −5.8 caudal of bregma. All TH(+) and Fos(+) cells were counted, and the expression of Fos in TH(+) neurons of VTA and SN was quantified. Brain slices were prepared as described previously (Riegel and Williams, 2008; Williams et al., 2014) from behaviorally tested TH:Cre rats with mCherry-tagged Gi-, Gq-, or Gs-coupled DREADDs, as described above. Briefly, brains were removed following rapid decapitation and placed in a vibratome (Leica) containing ice-cold ACSF solution (126 mm NaCl, 2.5 mm KCl, 1.2 mm MgCl2, 1.4 mm NaH2PO4, 25 mm NaHCO3, 11 mm d-glucose, 0.4 mm ascorbate, and 0.01 mm MK801). Horizontal slices (220 m) containing the VTA were prepared and stored in oxygenated ACSF containing 0.01 mm MK801 (95% O2-5% CO2; 34°C) until recording. During recording, sections were perfused at a flow rate of 2 ml/min with oxygenated ACSF, at 33°C. DA neurons residing 150 μm from the lateral or medial side of the terminal nucleus of the accessory optic tract were visualized with infrared differential interference contrast optics to confirm mCherry fluorescence indicative of DREADD expression. Recordings were made using Multiclamp 700B Amplifiers (Molecular Devices) and collected with AxoGraph X (AxoGraph), filtered at 1–2 kHz, and digitized at 2–5 kHz. Spontaneous AP firing was monitored using either whole-cell current-clamp or cell-attached recording configurations with 1–2 m pipettes filled with 115 mm K-methylsulfate, 20 mm NaCl, 1.5 mm MgCl2, 2.5 mm HEPES, 2 mm ATP, 0.3 mm GTP, and 0.1 mm EGTA, pH 7.3 and 265–270 mOsm. Firing rates were evaluated in the cell-attached configuration. Only neurons displaying stable pacemaker firing (1–5 Hz) for the duration of the experiment were included for analysis of firing rates in response to CNO (5 μm; washed onto slices following stable baseline recordings). Separate, behaviorally naive TH:Cre rats (Gq, n = 8; Gs, n = 8; Gi, n = 6; WT, n = 8) were killed, and their brains were rapidly removed and prepared as previously described (Brodnik and España, 2015). Coronal slices (400 μm) of the striatum were maintained at 32°C in oxygen-perfused (95% O2-5% CO2) ACSF, which consisted of the following (in mm): NaCl 126, NaHCO3 25, d-glucose 11, KCl 2.5, CaCl2 2.4, MgCl2 1.2, NaH2PO4 1.2, and l-ascorbic acid 0.4, with pH adjusted to 7.4. A carbon fiber microelectrode (150–200 μm length × 7 μm diameter) and a bipolar stimulating electrode (Plastics One) were placed in the NAc. The carbon fiber electrode potential was linearly scanned as a triangular waveform from −0.4 to 1.2 V and back to −0.4 V (Ag vs AgCl) using a scan rate of 400 V/s. Cyclic voltammograms were recorded every 100 ms by means of a potentiostat (Dagan) using Demon Voltammetry and Analysis (Yorgason et al., 2011). Extracellular concentrations of DA were assessed by comparing the current at the peak oxidation potential for DA with electrode calibrations with 3 μm DA. DA release was evoked every 5 min by a single 4 ms stimulation (monophasic, 400 μA), until three stable baseline responses were acquired (<10% variation) before CNO was added to the perfusion medium. Following the application of CNO (5 μm), we evaluated DA release to both a single pulse and multiple pulses (five pulses at 5–40 Hz). In separate rats without cocaine experience (Gq, n = 8; Gs, n = 2; Gi, n = 8; mCherry, n = 4), we performed extracellular, anesthetized recordings of single units in VTA, before and after intraperitoneal injection of CNO (10 mg/kg). Animals were anesthetized with 2–3% isoflurane and maintained at a rectal temperature of 36–38°C throughout the recordings. Affixed in a stereotaxic instrument, craniotomies were prepared dorsal to VTA, exposing the brain surface from 0.5 to 1.3 mm lateral of midline and 4.0–7.0 caudal of bregma. Following previously described procedures (Georges and Aston-Jones, 2002; Kaufling and Aston-Jones, 2015), glass micropipettes (filled with 2% pontamine sky blue in 0.5 m sodium acetate; tip internal diameter, ∼1 μm; impedance, 6–12 mΩ) were advanced through VTA between the following coordinates (relative to bregma): AP, −5.1 to 6.1; ML, ±0.5–1.1; DV, −7.0 to 9.0. They were implemented in a consistent grid-based sampling method (Grace et al., 2007) with >200 μm between consecutive tracks and <400 μm between at least one pre-CNO and post-CNO track within a given animal. Signals were amplified and filtered (1000× gain, 50–4000 Hz bandpass) using conventional electronics, sent to an audio monitor and oscilloscope for on-line monitoring (high pass, 50 Hz; low pass, 16 KHz), and digitized and recorded via CED 1401 and Spike 2 software (Cambridge Electronic Design). When single-unit activity was detected by monitoring audio and oscilloscope outputs, we advanced slowly upon the cell until it was isolated at a signal/noise ratio of ∼2:1 or better. All isolated units (n = 400) were recorded for 120 s, then the electrode was lowered 200 μm, and sampling resumed. After sampling two to nine tracks per rat, we injected CNO (10 mg/kg, i.p. ), and from 30 to 210 min later, we sampled an additional one to four tracks per rat (a maximum 3 h after CNO injection). Pontamine sky blue was deposited electrophoretically at the end of the last track each day before perfusion, and recording sites within VTA were reconstructed. Cells were classified as type 1 (“Classic DA-like”) or type 2, based on conventional criteria described in detail previously (Grace and Bunney, 1984; Luo et al., 2008; Ungless and Grace, 2012). The mean number of type 1 and 2 cells encountered per track was compared before and after CNO. Colocalization of mCherry and TH in mPFC and NAc. We examined colocalization of TH (a putative marker of DAergic axonal microdomains; Zhang et al., 2015) with mCherry in a subset of the cocaine-experienced rats described above (n = 10). We imaged areas of prelimbic cortex (layers 5 and 6) and NAcCore (immediately dorsal and medial of the anterior commissure) from DREADD-infected rats (Gq, n = 4; Gs, n = 2; Gi, n = 4). Z-series confocal microscopy datasets were acquired with the exact same parameters for PFC and NAc sections. Images were taken through the entirety of the tissue slice for both regions using a 63× objective with a voxel size of 0.24 × 0.24 × 0.504. Two z-series datasets were taken for each animal, one on each hemisphere. Values obtained for these two datasets were averaged to create an animal average for each brain region investigated. All laser and gain settings were kept constant between animals and between brain regions. Once datasets were collected they were deconvolved using autoquant deblur and imported into Imaris (Bitplane). Once in Imaris, threshold values for colocalization analysis of DREADD and TH signals were automatically set by the Imaris software colocalization module. Values set by Imaris for colocalization signal intensity thresholds were not significantly different for DREADD (red) or TH (green) signals in either the mPFC or NAc, nor did mCherry expression differ between DREADD groups. For behavioral and colocalization, and Fos analyses, mixed-model and repeated-measures ANOVAs with Bonferroni-corrected post hoc t test, or paired-samples t tests were used as appropriate. When data were not normally distributed, nonparametric statistics [Mann–Whitney U (MWU) test; Friedman's test] or Greenhouse–Geisser degrees of freedom corrections were used. Cocaine economic demand was stabilized for >2 d before each test, then the change from this stable baseline after vehicle or CNO administration was computed and analyzed with repeated-measures ANOVA. Pearson correlations were computed to examine the relationship between locomotor and reinstatement effects of CNO (change from vehicle day horizontal locomotion and cue-induced cocaine seeking after 10 mg/kg CNO). For in vitro physiology, spontaneous firing rate in the 30 s before or after CNO bath application (5 μm, 4–6 min) was measured in one to two mCherry fluorescing VTA neurons per rat. For in vitro voltammetry, evoked DA was computed as a percentage of pre-CNO baseline, and a mixed-model ANOVA determined the effects DREADD group × stimulation frequency. For in vivo physiology, the mean number of type 1 and 2 neurons per recording track per rat, before versus after CNO, were compared using unpaired t tests in each DREADD group. All experiments were conducted in at least two cohorts, boosting confidence in the reliability of the reported effects. In male TH:Cre rats or their WT littermates (250–400 g) bred at MUSC, UCI, or Drexel University, we targeted injections of Cre-dependent DIO vectors to VTA, causing the expression of mCherry-tagged Gq-, Gs-, or Gi-coupled DREADDs; mCherry in VTA DA neurons in TH:Cre rats; or no DREADD expression in WT rats (Fig. 2a). Expression of the DREADD-fused mCherry tag was highly specific to VTA/medial SN TH(+) neurons in TH:Cre rats, as previously reported (Witten et al., 2011; Mahler et al., 2014), with >97% coexpression of TH in mCherry+ cell bodies in ventral midbrain (Tye et al., 2013; Mahler et al., 2014). Overall, >70% of VTA TH(+) neurons coexpressed DREADDs, while only ∼10% of lateral SN DA neurons expressed DREADDs (Fig. 2b). DREADD expression spanned nearly the entire rostrocaudal axis of VTA in these animals, typically with sparser expression in medial than in lateral aspects of VTA, and extended into the most medial aspects of SN pars compacta. No significant differences in VTA infection rate of cell bodies was seen among Gi-, Gs-, and Gq-coupled vectors (no effect of DREADD group on colocalization percentage: F(2,23) = 0.576, p = 0.57; Fig. 2b), though we note that the infected neurons are not necessarily identical populations across vectors. No DREADD/mCherry expression was seen in WT control rats. DREADD expression and function in VTA DA Neurons. a, Midbrain TH staining (green) and mCherry-tagged DREADD expression (red) in VTA is shown, with yellow indicating colabeling. Inset shows schematic of AAV DIO-DREADD vectors used. b, Percentage of midbrain TH+ cells located within borders of SN (white bars), or VTA (black bars) that coexpress mCherry-tagged DREADDs. Individual rat data shown with red diamond (Gq), yellow triangle (Gs), or blue square (Gi) symbols. c, Percentage of TH+ VTA neurons expressing Fos after Veh or CNO (10 mg/kg) in Gq-, Gs-, or Gi-coupled DREADD rats (individual rat data represented with symbols on top of bars). d, Firing rates are depicted for baseline and post-CNO periods, and individual cells are depicted with lines. e, CNO increases the mean (SEM) firing rate of VTA DREADD+ neurons in vitro, relative to baseline firing. f, In anesthetized rats with Gq DREADDs, more type 1 cells were encountered per electrophysiological recording track after 10 mg/kg CNO injection (colored bars, symbols) than before CNO injection (white bars, symbols). No significant effects on population activity were observed after CNO injection in the Gs, Gi, or mCherry groups. g, Interspike interval before CNO injection (black lines, error bars indicate the SEM) and after 10 mg/kg, i.p., CNO injection (red, Gq; yellow, Gs; blue, Gi; black, mCherry). *p < 0.05. As expected, CNO (10 mg/kg) markedly induced Fos in TH(+) VTA neurons of rats expressing Gq, but not Gi DREADDs (DREADD group × Tx interaction; F(2,35) = 3.4, p = 0.046; Fig. 2c). Acute stimulation of VTA DA neurons with CNO (10 mg/kg) in Gq rats increased over vehicle the percentage of TH(+) VTA neurons that expressed Fos (main effect of Tx in Gq rats; MWU test, p = 0.001), whereas Fos in TH(−) VTA neurons was concurrently suppressed (MWU test, p = 0.03). In a small sample of Gs rats, CNO (n = 4) similarly increased Fos in TH(+) neurons over vehicle controls (n = 8; Tx effect; MWU test, p = 0.004), but Fos expression in TH(−) VTA neurons was not altered (MWU test, p = 0.68, n.s.). Fos was not significantly reduced by CNO in Gi rats [TH(+) neurons Tx effect: MWU test, p = 0.26, n.s. ; TH(−) neurons: p = 1.0, n.s. ; Fig. 2c], likely because Fos expression was already very low in control rats treated with vehicle in their home cage. To further characterize DREADD modulation of DA cell activity, we recorded the effects of CNO on firing in vitro and in vivo. First, horizontal VTA slices were prepared as described previously (Williams et al., 2014), and DREADD-expressing (mCherry+) cells were sampled in the cell-attached configuration to record spontaneous firing rates. We detected no difference in the basal firing rates of DA neurons expressing Gq, Gs, or Gi (in hertz: F(2,16) = 0.658, p = 0.531). After washing on CNO (5 μm), both Gq- and Gs-expressing DA neurons increased firing compared with pre-CNO baseline (Gq: t(6) = 2.9, p = 0.028; Gs: t(4) = 5.4, p = 0.006), but CNO did not affect spontaneous firing in slices from Gi rats (t(6) = 0.04, p = 0.968; Fig. 2d,e). We next examined whether CNO affects the number of spontaneously active VTA cells recorded in vivo in isoflurane-anesthetized rats. Using a systematic grid-based cells/track sampling method (Lodge and Grace, 2006), we performed preliminary analyses of all well-isolated cells encountered in the 3.5 h before and after intraperitoneal CNO injections (pre-CNO, n = 257; post-CNO, n = 143). We analyzed data from the two most commonly sampled types of neurons encountered in VTA: type 1 neurons with a >2 ms waveform and a <10 Hz firing rate, which are likely to be a subset of DAergic neurons (Ungless and Grace, 2012; n = 200), and type 2 neurons with <2 ms waveforms, a >10 Hz firing rate, and an uncharacterized phenotype (n = 200). CNO (10 mg/kg) did not affect the numbers of type 1 or type 2 cells encountered in Gi, Gs, or mCherry rats (Gi: F(1,49) = 0.3, p = 0.57; Gs: F(1,12) = 1.3, p = 0.27; mCherry: F(1,26) = 3.1, p = 0.09; type 2: F values <0.73, p values >0.4), but did increase the prevalence of active type 1 cells in Gq rats (F(1,46) = 4.0, p = 0.05) without affecting type 2 prevalence (F(1,46) = 0.72, p = 0.790). This indicates that Gq stimulation induced activity in a subset of otherwise quiescent VTA DA cells (Fig. 2f). We also examined the effects of DREADD manipulations on firing rates of VTA DA neurons and found, relative to interspike intervals (ISIs) before CNO, CNO decreased ISIs in Gq rats, increased ISIs in Gi rats, and did not alter ISIs in Gs or WT rats (Gq: F(1,2000) = 125.5, p < 0.0001; Gi: F(1,3600) = 57.45, p < 0.001; Gs: F(1,800) = 1.85, p = 0.17; mCherry: F(1,1600) = 2.03, p = 0.15; Fig. 2g). Although the sample sizes in this experiment are small, results are consistent with those of other assays of DREADD efficacy in modulating DA neuron activity. Having validated chemogenetic modulation of DA neurons, we next examined the effects of these manipulations on cocaine-seeking behaviors. Addiction is a chronic relapsing disorder, so we examined chemogenetic DA neuron manipulation effects in a rat model of relapse elicited by cocaine cues, priming, or stress (Bossert et al., 2013; Martin-Fardon and Weiss, 2013). Although these stimuli elicit similar levels of drug-seeking behavior, the neural substrates underlying each type of reinstatement are distinguishable (Stewart, 2000; Kalivas and McFarland, 2003; Mahler et al., 2014; Farrell et al., 2018). Therefore, we sought to determine the necessity and sufficiency of VTA DA neurons for reinstatement of cocaine seeking. After 10 d of cocaine self-administration followed by extinction training, we queried the effects of DA neuron stimulation or inhibition on reinstatement behavior (i.e., pressing the previously cocaine-delivering active lever) due to (1) DA neuron manipulation alone (CNO-induced reinstatement in an extinguished context without cues or cocaine), (2) cue-induced reinstatement (active lever response-contingent cocaine cues, but no cocaine), (3) cocaine-primed reinstatement (10 mg/kg, i.p., cocaine before test, no cues or additional cocaine), and (4) pharmacological stress enhancement of cued reinstatement [2.5 mg/kg, i.p., YOH, with response-contingent cues but no cocaine]. Each reinstatement modality was tested three times in each rat, each 30 min after counterbalanced injections of CNO (0, 1, and 10 mg/kg). Under all reinstatement conditions examined, CNO robustly increased cocaine-seeking behavior up to 2000% of vehicle day levels in Gq rats (effect of Tx on CNO-induced reinstatement: F(2,12) = 4.8, p = 0.03; on cued reinstatement: F(2,12) = 6.1, p = 0.02; on primed reinstatement: F(2,12) = 7.1, p = 0.009; on YOH reinstatement: F(2,12) = 4.1, p = 0.045; Fig. 3a, and Fig. 3-1a). CNO effects were specific to the active lever (as opposed to the always inert inactive lever) in the CNO-induced reinstatement test (Tx × lever interaction: F(2,12) = 6.2, p = 0.014) and trended toward such specificity in cued reinstatement (F(2,12) = 3.4, p = 0.068). CNO increased pressing on both levers equivalently on cocaine-primed (no interaction; F(2,12) = 1.7, p = 0.23) and YOH reinstatement tests (F(2,12) = 2.2, p = 0.158). CNO effects on active lever pressing did not statistically differ by CNO dose (change from vehicle day active lever pressing after 1 or 10 mg/kg CNO; t values <1.55, p values <0.171), nor did effects dissipate over the 2 h test (no dose × time interaction: F(6,36) values <2.4, n.s. ; Fig. 4a). Reinstatement of cocaine seeking is modulated by chemogenetic DA neuron manipulations. 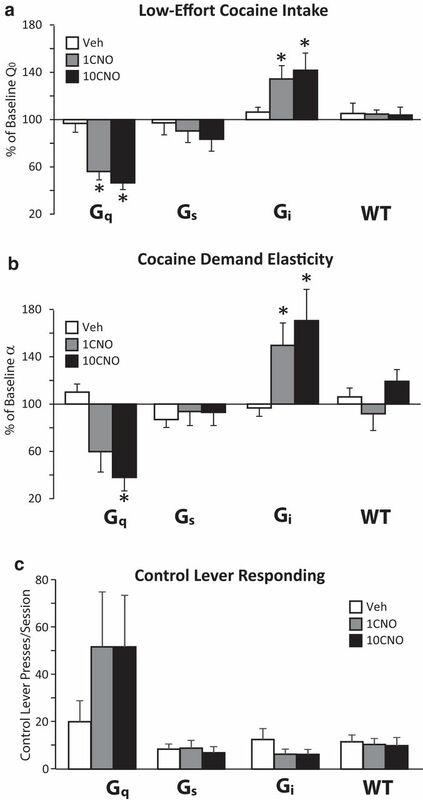 a, In Gq-DREADD rats, CNO (1 mg/kg, gray bars; 10 mg/kg, black bars) increased cocaine seeking (relative to vehicle, white bars) in the absence (CNO-induced reinstatement) or the presence of cues, and after a cocaine prime (no cues) or yohimbine (YOH + cues) test (10 mg/kg). b, CNO failed to increase reinstatement in Gs-DREADD rats. c, In Gi-DREADD rats, CNO reduced the priming effects of cocaine and the potentiation of cued responding by YOH (10 mg/kg). d, No effects of CNO were observed in WT rats with no DREADD expression. Light gray bars indicate inactive lever presses for each test. *p < 0.05 e, f, Effects of CNO (0, 1, 10 mg/kg) on horizontal locomotion (e) and rearing behavior is shown for DREADD-expressing and WT animals (f). Gq stimulation increased and Gi stimulation decreased locomotor activity in a familiar environment. Individual rat data are shown in Figure 3-1, and locomotion time course is shown in Figure 3-2. Time course of cue-induced reinstatement. a–d, Time course of active lever (solid lines) and inactive lever (dashed lines) are shown for Gq (a), Gs (b), Gi DREADD (c), and WT control (d) rats after vehicle or CNO administration (1, 10 mg/kg). Data are shown in 30 min bins throughout the 120 min session. Lines represent the mean, and error bars represent the SEM. *p < 0.05, interaction of dose × time. In contrast to Gq rats, CNO did not robustly enhance cocaine seeking in rats with equivalent expression of Gs DREADDs in VTA DA neurons (Fig. 3b). Cued reinstatement was marginally increased by CNO (main effect of Tx: F(2,20) = 4.780, p = 0.02), but post hoc analysis of CNO dose effects on active lever pressing failed to meet the Bonferroni-corrected threshold (1 mg/kg: t(10) = 2.469, p = 0.033; significance threshold: p < 0.025). However, cue-induced active lever pressing was increased by 1 mg/kg (not 10 mg/kg) CNO for the first 30 min of the 2 h session, after which cocaine seeking returned to vehicle-equivalent levels (Tx × time interaction: F(2.4,23.7) = 9.5, p = 0.001; no effect on inactive lever pressing: F(6,60) = 0.9, p = 0.5; Fig. 4b). Other reinstatement modalities were not reliably affected by CNO in Gs rats (CNO-induced reinstatement: F(2,16) = 0.6, p = 0.56; prime: F(2,18) = 1.0,p = 0.38; YOH: F(2,8) = 1.6, p = 0.26). Effects of engaging Gi-coupled DREADDs in VTA DA neurons on reinstatement behavior was notably dependent on the type of reinstatement tested, presumably because DA neurons are differentially recruited during cocaine seeking under these different behavioral circumstances (Fig. 3c). In Gi DREADD rats, CNO attenuated reinstatement elicited by either a cocaine-priming injection (F(2,14) = 6.6, p = 0.009) or YOH injection (F(2,14) = 3.87, p = 0.046). Pressing on both levers was decreased during primed reinstatement (no interaction of Tx × lever: F(2,14) = 0.96, p = 0.4), but only on the active lever during YOH reinstatement (F(2,14) = 4.5, p = 0.031). In the CNO-induced reinstatement test without cues, cocaine, or YOH, CNO failed to affect the already low levels of lever pressing (F(2,14) = 0.04, p = 0.97). Intriguingly, despite the clear role for DA in conditioned seeking of cocaine and other rewards (Berridge, 2007; Everitt et al., 2008; Clark et al., 2012; Salamone and Correa, 2012; Mahler et al., 2014), CNO in Gi rats did not significantly reduce cue-induced active lever pressing relative to vehicle day (no Tx effect on active lever pressing: F(2,14) = 0.5, p = 0.61; Fig. 3c). Instead, CNO (10 mg/kg) in these animals increased pressing on the inactive lever (F(2,18) = 3.7, p = 0.045; 1 CNO, p = 0.7; 10 CNO, p = 0.048), despite the fact that presses on this lever were never reinforced at any point in training or testing [though we note that a dose (0, 1, 10 mg/kg) × lever (active, inactive) overall interaction was not statistically significant: F(2,68) = 2.14, p = 0.13]. No similar effects of CNO were observed during other types of reinstatement in Gi rats, or in other DREADD groups during reinstatement of any type (F(2,14) values <0.78, p values >0.48). We next queried whether chemogenetic DA neuron modulation affects the free consumption of, or motivation for, cocaine. CNO in Gq rats robustly decreased free cocaine consumption (Tx effect on Q0; F(2,12) = 6.584,p = 0.012; Fig. 5a), indicating that increased Gq signaling in these neurons partially substitutes for the subjective effects of cocaine, since less cocaine is desired at low effort. Demand elasticity (α parameter) in Gq rats was also decreased by CNO, indicating that DA neuron activation increased the effort expended to obtain cocaine as doses decreased during the session, consistent with increased motivation for drug (Tx effect on α: F(2,12) = 11.44, p = 0.002; Fig. 5b). In contrast, the stimulation of Gs DREADDs in DA neurons failed to significantly affect either free consumption or demand elasticity (α: F(2,14) = 0.03217, p = 0.97; Q0: F(2,14) = 0.83, p = 0.46). Stimulation of Gi DREADDs in these neurons caused animals to consume more cocaine under low-effort conditions (Tx effect on Q0: F(2,24) = 3.771, p = 0.038), and demand became more elastic (α increased, motivation decreased; Tx effect on α: F(2,24) = 4.42, p = 0.023), the opposite of Gq stimulation effects. No effects of CNO were observed in WT control rats (α: F(2,14) = 1.765, p = 0.207; Q0: F(2,14) = 0.009, p = 0.991; for individual rat data: Fig. 5-1), and CNO did not significantly alter inactive lever pressing during economic tests in any group (Gq: F(2,12) = 1.096, p = 0.365; Gs: F(2,12) = 0.147, p = 0.86; Gi: F(1.36,17.64) = 3.22, p = 0.08; WT: F(2,14) = 0.93, p = 0.91; Fig. 5c). These results together indicate that DA neurons play at least two distinct roles in cocaine intake, mediating the subjective effects of cocaine under low-effort conditions and facilitating the motivation to pursue cocaine under high-effort conditions. Future studies should determine whether the same DA neurons and projections underlie functions related to cocaine free consumption and motivation, or whether these are instead mediated by separate DA neurons within VTA. DA neuron modulation affects low-effort cocaine intake and demand elasticity. a, Effects of CNO (0, 1, or 10 mg/kg) in Gq, Gs, and Gi DREADD rats, or WT rats on free cocaine intake (Q0) are depicted. b, Effects of CNO on demand elasticity (α) are depicted. When VTA DA neurons were stimulated, rats preferred less cocaine but worked harder to obtain this lower dose. When DA neurons were inhibited, subjects preferred more cocaine but were less willing to work hard to obtain it. c, No effects of CNO were found on control (inactive) lever responding during economic demand tests. *p < 0.05. Individual rat data are shown in Figure 5-1. Though CNO can have off-target effects affecting behavior (MacLaren et al., 2016; Gomez et al., 2017; Manvich et al., 2018), effects here were specific to DREADD-expressing rats, as there was no effect of either CNO dose in WT rats on: lever pressing during the CNO-induced reinstatement test (F(2,18) = 1.13, p = 0.344), cue (F(2,18) = 0.73, p = 0.495), primed (F(2,18) = 1.42, p = 0.27) or YOH reinstatement (F(2,16) = 0.65, p = 0.537; Fig. 3d), or cocaine demand (α: F(2,14) = 1.765, p = 0.207; Q0: F(2,14) = 0.009, p = 0.991; Fig. 5). Neither did we find evidence of constitutive effects of DREADDs in the absence of CNO, as the behavior of Gq, Gs, and Gi DREADD, and WT rats did not differ before CNO on cocaine self-administration (total self-administered cocaine infusions: F(3,32) values <1.8, p values >0.17; Fig. 6a,b) or lever pressing during extinction (no day × group interaction: F(8.7,92.8) = 1.6, p = 0.14; Fig. 6c), nor did groups differ on vehicle day in reinstatement behavior (CNO-induced reinstatement, F(3,30) = 0.189; cue, F(3,32) = 0.27; prime, F(3,31) = 2.238; YOH, F(3,25) = 1.697; Fig. 6d), cocaine demand (α: F(3,28) = 1.055, p = 0.3839), or locomotor activity [horizontal activity (Horiz) F(3,29) = 1.728; vertical rearing behavior: F(3,29) = 0.664]. DREADDs do not affect behavior in the absence of CNO. No significant effects of DREADD expression are observed in the absence of CNO. 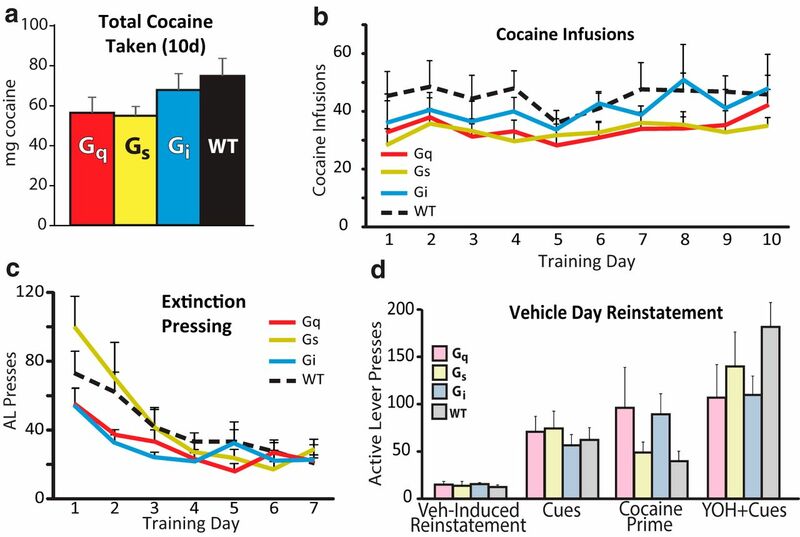 a–d, Rats with DREADDs (Gq, red; Gs, yellow; Gi, blue) or no DREADDs (WT controls, black) did not differ in the total number of milligrams of cocaine self-administered throughout training (a), the number of daily cocaine infusions across the 10 d training period (b), active lever pressing across the first 7 d of extinction training (c), or active lever pressing on reinstatement (d). Bars and lines represent the mean, and error bars represent the SEM. Given the intimate involvement of G-protein signaling in synaptic plasticity and prior reports of the persistent effects of Gs DREADD stimulation (Ferguson et al., 2013; Nakajima et al., 2016), we searched for persistent effects of prior-day CNO (compared with those of prior-day Veh) on behavior. No such effects were found during extinction retraining days following each CNO/vehicle reinstatement test (extinction test: F(2,16) = 0.141; cue: F(2,20) = 0.331; prime: F(2,18) = 0.57; YOH: F(2,50) = 0.078), or on cocaine intake following CNO/vehicle economic demand tests (no effect of Tx on α: F(2,36) = 1.229; or no effect of Q0 on α: F(2,36) = 0.846; Fig. 7e,f), though subtler carryover effects cannot be totally excluded, as nonsignificant trends to this effect were occasionally seen (Fig. 7a,f). Together, these findings show that DREADD manipulations specifically and reversibly increase or decrease VTA DA neuron function, as expected. CNO does not have persistent effects on behavior. 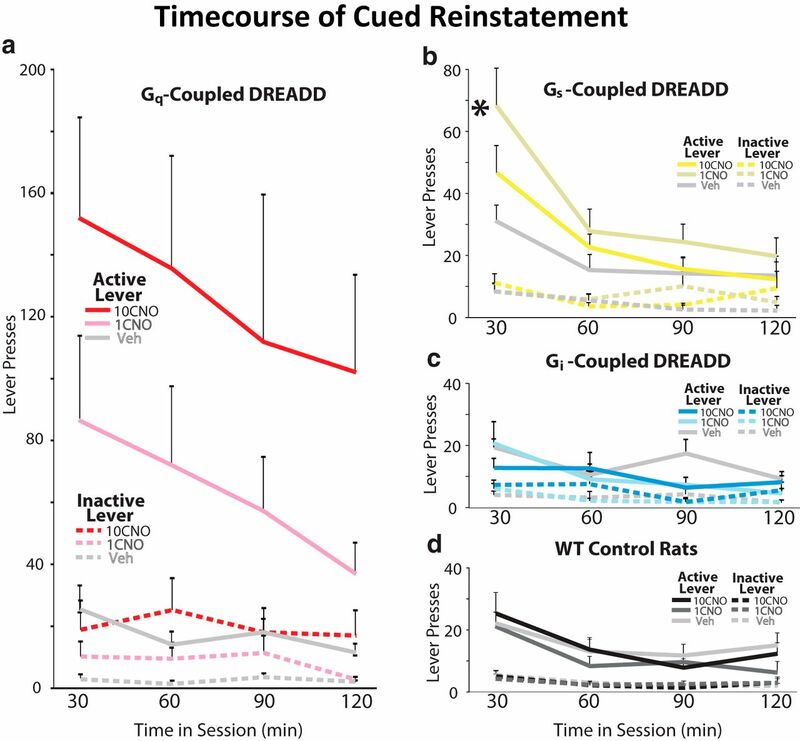 a–d, No evidence for long-lasting effects of CNO in Gq-DREADD (a), Gs-DREADD (b), Gi-DREADD (c), or WT control (d) rats were found, as demonstrated with active lever presses on the extinction retraining trial held 24 h after the injection of vehicle (white bars), 1 mg/kg CNO (light red, yellow, blue, black bars), or 10 mg/kg CNO (dark color bars). e, f, Similarly, no persistent effects of prior-day CNO were observed on demand elasticity (α; e) or free cocaine intake (Q0; f). Bars represent the percentage of preinjection baseline on day following administration of vehicle, or 1 or 10 mg/kg CNO. To characterize potential nonspecific motor effects of VTA DA neuron manipulations that could alter lever pressing, in a subset of each DREADD group, we examined the effects of systemic CNO on Horiz and rearing in a prehabituated test cage. CNO increased activity in Gq rats across the entire 2 h session (Horiz: F(1.042,5.21) = 6.774, p = 0.046; Rears: F(2,10) = 6.038, p = 0.019), trended toward decreasing activity in Gi rats (Horiz: F(2,16) = 3.253, p = 0.065; Rears: F(2,16) = 2.239, p = 0.139), and did not affect activity in Gs or WT rats (Gs Horiz: F(2,20) = 1.43, p = 0.263; Rears: F(2,20) = 2.007, p = 0.161; WT Horiz: F(2,12) = 1.364, p = 0.293; Rears: F(2,12) = 3.129, p = 0.081; Fig. 3e,f). CNO locomotor stimulation persisted for at least 2 h in Gq rats (no interaction of Tx × time: F(6,36) = 1.184, p = 0.337; Fig. 3-2). Reinstatement effects of Gq stimulation were stronger than locomotor activation effects in the same rats (mean cue reinstatement effect of 10 CNO, 1116.4% of vehicle day; Horiz locomotion effect, 361.5%), and the locomotion effects versus the motivation-enhancing effects of CNO in the same Gq rats were not correlated (change from vehicle Horiz not related to CNO effect on: cue reinstatement, r = −0.794, p = 0.06; CNO-induced reinstatement, r = −0.494, p = 0.32; prime: r = −0.539, p = 0.27; YOH, r = −0.072, p = 0.892). DREADDs are robustly anterogradely transported and are readily observed in axons in forebrain DA neuron targets, including NAc, mPFC, and BLA. To verify chemogenetic modulation of presynaptic DA release, we prepared coronal slices of NAc from TH:Cre rats with Gq, Gs, or Gi DREADD-expressing VTA DA neurons, and DA release was measured using fast-scan cyclic voltammetry (Ferris et al., 2013; Brodnik and España, 2015; Bucher and Wightman, 2015) before and after washing CNO (5 μm) onto the slice, and in response to a single electrical pulse or multiple pulses across tonic and phasic frequencies (five pulses at 5–40 Hz). CNO increased evoked DA in Gq rats (F(1,21) = 5.472, p = 0.029) and decreased it in Gi rats (F(1,21) = 12.77, p = 0.0018), but did not affect the release in Gs or WT rats (F(1,21) = 0.153, p = 0.6989; Fig. 8a). This indicates that DREADDs can be used to bidirectionally modulate DA release from VTA DA neuron terminals in a pathway-specific manner. Chemogenetic pathway-specific stimulation of VTA DA terminals. a, In acute coronal NAc slices from rats with Gq DREADDs in VTA DA neurons, DA release was evoked with local electrical stimulation (single pulse, 20 or 40 Hz) before or after bath application of CNO (1 μm), measured using cyclic voltammetry. Bars depict the percentage of baseline (pre-CNO) DA release after CNO administration in Gq-, Gs-, or Gi- DREADD rats, or WT rats. CNO facilitated DA release in Gq-DREADD rats at all stimulation parameters and decreased DA release in Gi-DREADD rats. No effects of CNO were seen in Gs-DREADD or WT rats. b, c, Gq DREADDs are robustly transported to targets including NAc (b) and mPFC (c). d, axon terminals of VTA TH(+) neurons, labeled with mCherry (red) colocalized with tyrosine hydroxylase (TH; green) to a greater extent in NAc compared with mPFC. e–l, Effects of CNO microinjection into NAc of WT rats without DREADDs (e, i), NAc of Gq DREADD rats (f, j), mPFC of Gq rats (g, k), or BLA of Gq rats (h, l) on reinstatement with (right bars) or without cues (left bars; e–h), or on 2 h chow intake in a separate test with the same rats (i–l). *p < 0.05, **p < 0.01. m–p, Microinjection sites are shown for WT (m), NAc Gq (n), mPFC Gq (o), and BLA Gq (p) animals. Individual rat data are shown in Figure 8-1. Given the robust enhancement of reinstatement by Gq DA neuron stimulation, we next sought to determine the corresponding contributions of VTA DA neuron projections to mPFC, NAc, and BLA for reinstatement or food intake behaviors. We and others have shown that applying CNO directly into the terminal fields of Gi DREADD-expressing neurons inhibits axonal release of neurotransmitters (Mahler et al., 2014; Stachniak et al., 2014; Wang et al., 2015; MacLaren et al., 2016; Lichtenberg et al., 2017), and here we examined for the first time whether projection-specific stimulation of dorsal mPFC, NAcCore, or BLA VTA DA neuron efferents affects behavior. A separate group of TH:Cre rats with Gq DREADDs in VTA and chronic bilateral cannulae in NAc, mPFC, or BLA were trained to self-administer cocaine, then extinguished. Effects of CNO microinjections (vs vehicle) on cocaine seeking in the absence or presence of response-contingent cues (CNO-induced or cued reinstatement tests) were measured. CNO injections in any of the three structures increased active lever pressing during cued reinstatement, indicating a similarly increased impact of cues after stimulation of each DA neuron projection (mPFC: F(1,8) = 14.024, p = 0.006; NAc: F(1,12) = 5.429, p = 0.038; BLA: F(1,8) = 6.424, p = 0.035; Fig. 8f–h and Fig. 8-1a). Increased pressing was specific to the active lever for mPFC and BLA, but not significantly for NAc (Tx × lever interaction: mPFC, F(1,8) = 8.676, p = 0.019; NAc, F(1,12) = 3.887, p = 0.072; BLA, F(1,8) = 8.26, p = 0.021). Importantly, NAc CNO, but not mPFC or BLA CNO, also induced cocaine seeking in the absence of cues, cocaine, or YOH (Tx effect on active lever pressing in CNO-induced reinstatement: mPFC, F(1,7) = 0.104, p = 0.757; NAc, F(1,12) = 15.448, p = 0.002; BLA, F(1,8) = 0.019, p = 0.894; Fig. 8f–h and Fig. 8-1b). 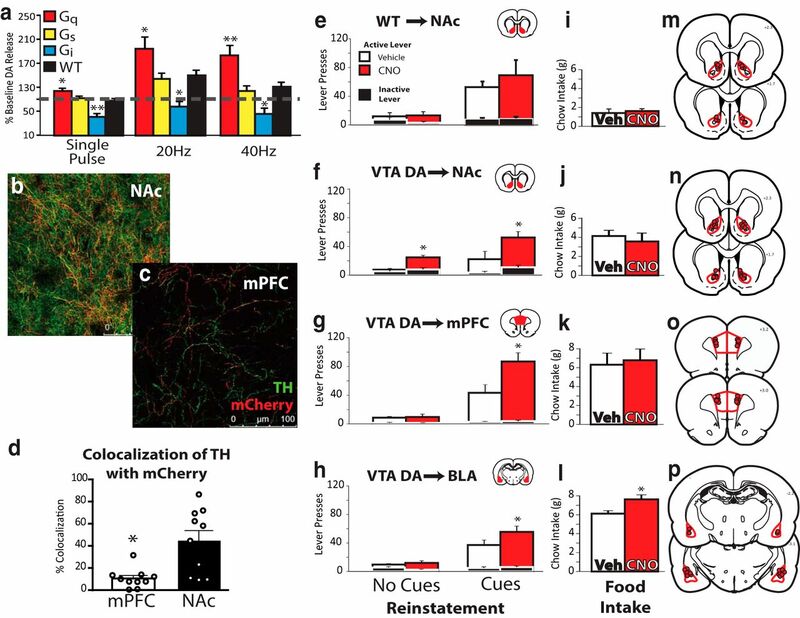 These data show that the stimulation of VTA DA neuron terminals in NAc alone, but not mPFC or BLA alone, is sufficient to generate seeking behavior even in the absence of endogenous circuit activity induced by Pavlovian cues. In contrast, microinjection of the same CNO dose in NAc of WT rats (lacking DREADD expression) failed to induce reinstatement (t(6) = 0.23, p = 0.83) or alter cue reinstatement (t(6) = −0.90, p = 0.40), demonstrating that 1 mm CNO in NAc did not display off-target effects in the absence of DREADDs (Fig. 8a and Fig. 8-1b). No effects of intracerebroventricular CNO on active/inactive lever ratio were seen in any brain region (no drug × region interaction on the ratio of active to inactive lever pressing: F(2,28) = 2.02, p = 0.15). In the same rats, we next examined a simple unconditioned reward procurement behavior (spontaneous chow intake) that is often linked to the activation of incentive motivation-linked mesolimbic pathways (Berridge and Robinson, 1998; Baldo and Kelley, 2007; Mahler and Berridge, 2009, 2012). Food intake was measured for 2 h after intra-mPFC, NAc, or BLA Veh/CNO microinjections (the fifth and sixth microinjections these rats received after reinstatement tests; Mahler and Berridge, 2012; Mahler et al., 2013, 2014; Fig. 8i–l and Fig. 8-1c). Neither mPFC nor NAc CNO injections altered spontaneous eating (mPFC: t(9) = 0.312, p = 0.762; NAc: t(10) = 0.782, p = 0.452), but BLA CNO increased food intake (t(6) = 2.466, p = 0.049)—to our knowledge, the first demonstration of unconditioned feeding induced by a manipulation of BLA. No effects of intra-NAc CNO was seen in WT rats (t(6) = 0.35, p = 0.74; Fig. 8e and Fig. 8-1). These findings show novel roles for DA neuron efferents to NAc in cocaine seeking, and to BLA in unconditioned food intake. Though DA neuron axonal stimulation had behavioral effects consistent with the enhancement of DA release, and such enhanced DA release is observed in NAc (Fig. 8a), DA neurons release other transmitters in addition to DA, including glutamate (Sulzer et al., 1998; Lapish et al., 2006; Hnasko et al., 2012; Trudeau et al., 2014; Zhang et al., 2015; Barker et al., 2016) and GABA (Tritsch et al., 2012; Stamatakis et al., 2013; Root et al., 2014). Perhaps relatedly, a marked lack of colocalization of mCherry [expressed exclusively in TH(+) neurons in VTA; Mahler et al., 2014] and TH (a requisite enzyme for DA production; Zhang et al., 2015) was observed in some targets, especially in mPFC (Fig. 8c). There was a significantly higher percentage of DREADD signal (red) colocalized with TH terminals (green) in NAc (Fig. 8b) when compared with the mPFC (t(18) = 3.530; p = 0.0024; Fig. 8d). Further inquiry into the neurochemical identity and behavioral functions of these TH-negative terminals originating from mPFC-projecting DA neurons is warranted, particularly given recent reports of marked neurochemical heterogeneity within VTA DA neurons and their axons (Tritsch et al., 2012; Trudeau et al., 2014; Zhang et al., 2015; Barker et al., 2016). Here we systematically compared the effects of chemogenetically manipulating VTA DA neurons, or their individual forebrain projections, during cocaine-taking and cocaine-seeking behaviors. These experiments revealed powerful, fundamentally modulatory roles for DA neurons in reinforcement, incentive motivation, and decision-making. Behavioral effects depended upon the GPCR signaling system and anatomical pathway which was experimentally engaged, as well as the behavioral and pharmacological context the animals were in. Overall, results show that the role of DA neurons in cocaine seeking is ultimately achieved by modulating behaviorally relevant mesocorticolimbic circuits. We find several distinct roles for VTA DA neurons in reinstatement behavior. 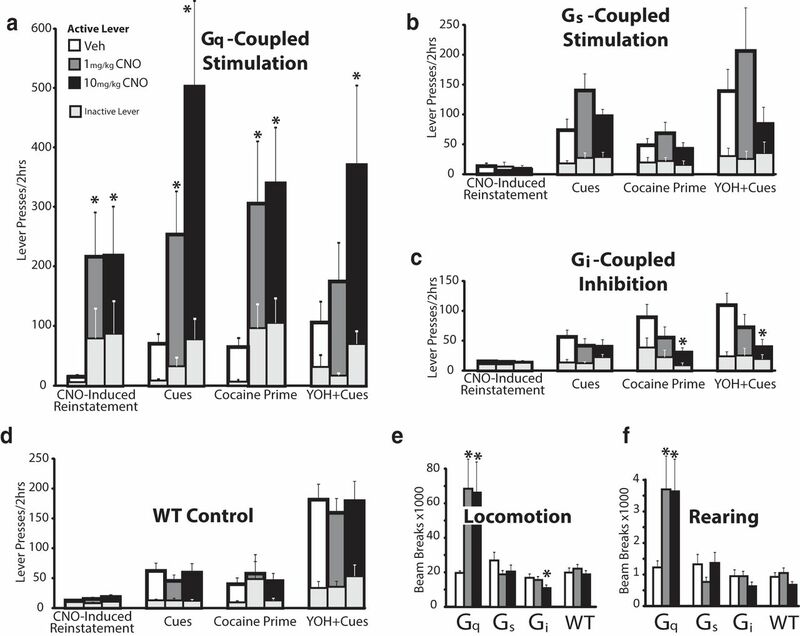 Gq DREADD stimulation reinstated extinguished cocaine seeking in the absence of cocaine cues, priming injections, or pharmacological stress—indicating the sufficiency of DA neuron Gq signaling for cocaine seeking. Gq augmentation of reinstatement behavior was strongest in the presence of response-contingent cocaine cues, suggesting a synergistic relationship between DA neuron stimulation and cue-induced cocaine seeking. Though DA neuron stimulation also increased general locomotor activity and inactive lever pressing during some types of reinstatement (by up to 350% of vehicle day), the magnitude of these effects was still weaker than that for the stimulation of cocaine seeking, and was uncorrelated with motivation-enhancing effects in individual rats. Furthermore, the suppression of low-effort responding (Q0) by Gq stimulation argues against mere locomotor activation explaining the results, but instead argues for the recruitment of both general arousal and reinforcement/motivation functions of VTA DA neurons in these studies. However, it is notable that motor activation typically accompanies increased motivation; these processes are intertwined, and DA neurons play a role in both of them. Stimulating Gs DREADDs in VTA DA neurons had only modest effects on cocaine-seeking and other behaviors. Indeed, the only significant effect of Gs stimulation was a mild increase in cue-induced cocaine seeking. In contrast, Gq stimulation in animals with equivalent DREADD expression dramatically increased cued cocaine seeking. As CNO enhanced DA neuron activity in Gs rats (as measured by Fos and in vitro firing), and Gs DREADDs have robust behavioral effects in other experiments (Ferguson et al., 2011, 2013; Gourley et al., 2016), our findings are unlikely to result simply from insufficient activity of the Gs DREADD receptor. 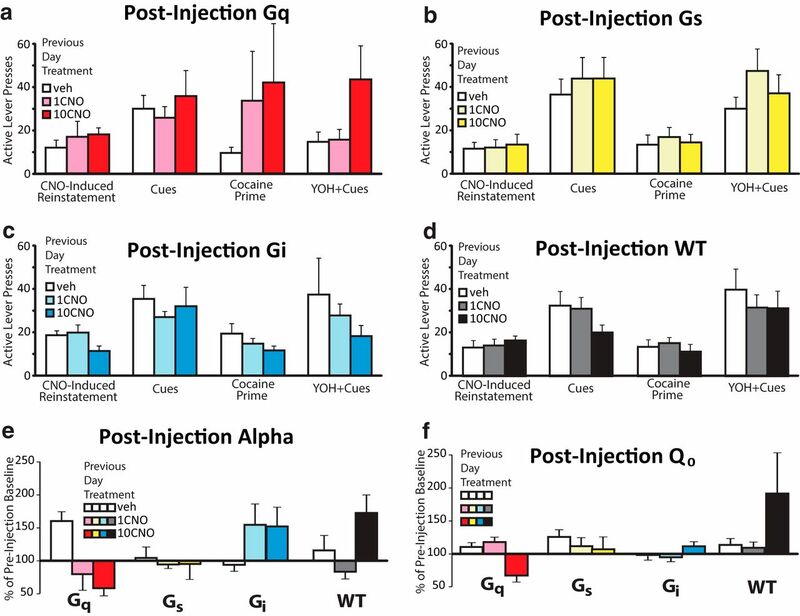 Instead, these findings reveal qualitatively different behavioral effects of Gq versus Gs signaling in VTA DA neurons, with preferential activation of motivation by Gq stimulation. Although not assessed here, Gq and Gs activation could differentially modulate the firing patterns of DA cells or the amount of DA released by them, as occurs with endogenous GPCR signaling in VTA neurons (Fiorillo and Williams, 2000; Foster et al., 2014). Also, given the crucial roles for cAMP-dependent Gs signaling in DA neuron plasticity (Shen et al., 2013), and the previous reports of Gs DREADD stimulation causing persistent behavioral effects (Ferguson et al., 2013; Nakajima et al., 2016), it is also possible that Gs signaling plays a larger role in learning than in the expression of previously learned motivation; this possibility should be tested in future studies. Inhibiting DA neuron activity with Gi DREADDs decreased some, but not all, types of reinstatement behavior. Engaging Gi DREADDs reduced the reinstatement elicited by either a cocaine prime or by cues plus the pharmacological stressor yohimbine. Given the known modulation of conditioned reward seeking by VTA DA neurons, and the fact that contralaterally disconnecting VTA DA neurons from direct connectivity with ventral pallidum (VP) using Gi DREADDs blocks cue-induced cocaine reinstatement (Mahler et al., 2014), it is surprising that bilateral inhibition of VTA DA neurons via Gi DREADDs failed to block cue-induced reinstatement. Instead, this manipulation appeared to alter the targeting of cue-triggered seeking, increasing the pressing of an inactive control lever that never yielded cocaine or cues without affecting cocaine lever pressing or control lever pressing during economic demand tests. Intriguingly, increased responding on an inactive manipulandum for cocaine was also previously reported for systemic DA antagonist administration (Willuhn et al., 2012), potentially representing a shift to the exploration of alternative strategies for attaining cocaine, rather than mere reinstatement inhibition, as occurs with VP/VTA DA neuron disconnection. Perhaps the opposing behavioral roles for VP GABA and glutamate neurons, or their distinct connectivity with VTA neuronal subpopulations (Faget et al., 2018; Tooley et al., 2018), contributes to this pattern of effects. Moreover, a role for VTA DA projections to VP (Heidenreich et al., 1995; Smith and Berridge, 2007; Stout et al., 2016; Chang et al., 2018), also disrupted in our prior study (Mahler et al., 2014), cannot be excluded. Regardless, our present findings with “global” VTA DA neuron DREADD inhibition points to a previously unappreciated complexity in DA neuron function in motivation and decision-making. Prior studies suggest that DA mediates the reinforcing subjective effects of psychostimulants, so blocking DA receptors causes rats to self-administer more cocaine to compensate (Suto and Wise, 2011; Willuhn et al., 2012). However, DA blockade also decreases effortful drug seeking, implying a role in motivation (Berridge, 2007; Salamone and Correa, 2012). Here, we concurrently tested both of these putative roles for DA in a within-session cocaine behavioral economic paradigm, and show that DA neurons participate in both processes. At the start of each session, preferred cocaine levels are easily attained, and cocaine intake was increased when DA neurons were inhibited or decreased when DA neurons were stimulated. This is consistent with the subjective effects of cocaine involving DA released from VTA neurons. However, later in the session rats were required to work harder to defend preferred cocaine blood levels. Then, DREADD stimulation increased responding, whereas Gi inhibition decreased it. This finding is consistent with the view that VTA DA neurons drive the motivation for cocaine. Plainly, when VTA DA neurons were stimulated, rats wanted less cocaine but worked harder to obtain what they wanted. During inhibition of DA neurons, rats wanted more cocaine but were less willing to work hard to obtain it. Therefore, these results indicate that VTA DA neurons are involved in both the subjective reinforcing, and motivational activating effects of cocaine, rather than playing any single role in reward. VTA DA neurons show remarkable molecular and physiological diversity, related both to the efferent targets of individual neurons and the behaviors these neurons regulate (Roeper, 2013; Lammel et al., 2014a; Barker et al., 2016; Saunders et al., 2018). Here we demonstrate that stimulating DA neuronal projections to NAc, mPFC, or BLA is sufficient for enhancing the motivational impact of previously learned cocaine cues, but only DA neuron terminals in NAc are sufficient to elicit reinstatement in the absence of discrete cues. We also found that stimulating DA neuron terminals in BLA enhances food intake, the first demonstration of BLA involvement in unconditioned feeding. We note, however, that chemogenetic stimulation of terminals of VTA TH(+) neurons via CNO microinjection also likely causes the release of both DA and non-DA transmitters (Tritsch et al., 2012; Trudeau et al., 2014; Barker et al., 2016)—especially in mPFC, where few DREADD-expressing axons extensively coexpressed TH in these cocaine-experienced rats. Notably, intracranial CNO (1 mm) effects are DREADD specific here (Fig. 8e,i) and previously (Mahler et al., 2014; Ge et al., 2017; Lichtenberg et al., 2017; McGlinchey and Aston-Jones, 2018; Mahler and Aston-Jones, 2018), suggesting minimal nonspecific behavioral effects of CNO or its metabolites here. These results call for further study of the relative roles of DA neuron projections to forebrain subnuclei, especially NAc core versus shell, and dorsal versus ventral mPFC, which would be expected to play distinct roles in cue-triggered reward seeking (Corbit et al., 2001; Di Chiara, 2002; Floresco et al., 2008; Hamlin et al., 2008; Peters et al., 2008; Ostlund et al., 2011; Saddoris et al., 2013; Moorman et al., 2015; Gourley and Taylor, 2016). No studies have shown that, like analogous optogenetic approaches, CNO microinjection upon Gq-DREADD-expressing axons causes antidromic excitation of DA neurons; however, we cannot exclude this possibility. Further work should also determine the pathway-specific necessity of DA neurons for reinstatement (e.g., using with Gi inhibitory DREADDs). Together, these data show for the first time that presynaptic Gq stimulation of DA neuron axons via CNO microinjection affects behavior, and does so in a pathway-specific manner. Our validation of bidirectional chemogenetic modulation of DA neurons in TH:Cre rats revealed several mechanisms through which the activation of DREADD receptors modifies DA system activity. CNO increased activity of Gq DREADD-expressing DA neurons as measured by in vitro firing and Fos expression, and also recruited otherwise quiescent populations of DA neurons in anesthetized rats and indirectly reduced Fos in TH(−) VTA neurons. CNO also increased Fos and in vitro firing in Gs rats, but did not affect Fos in TH(−) VTA neurons or alter population activity in vivo. Finally, CNO in Gi rats failed to reduce firing or Fos in DA neurons under the measured circumstances, in which DA neuron firing was not robustly stimulated by endogenous behavior-related activity (in vitro slices, anesthetized rats, or home-cage conditions for Fos). We also examined the ability of DREADDs to presynaptically modulate NAc DA release, as is possible with inhibitory DREADDs in other neural circuits (Mahler et al., 2014; Stachniak et al., 2014; Buchta et al., 2017; Ge et al., 2017; Lichtenberg et al., 2017; McGlinchey and Aston-Jones, 2018). Electrically evoked DA release was augmented by CNO in slices from Gq rats, reduced in Gi rats, and unaffected in rats without DREADDs or with Gs DREADDs, thereby validating the efficacy of axonally applied CNO to bidirectionally modulate DA release via Gi/o- or Gq-coupled signaling. A key advantage of DREADDs for intervening in neural circuits is the potential for the translation of this or related approaches to the mental health clinic. The proximate cause of psychiatric disorders involves the abnormal function of neural circuits, and a chemogenetic approach could therefore be useful in correcting neural activity with potentially fewer side effects than traditional psychotropic drugs or chronically implanted hardware. Such approaches will require extensive preclinical evaluation, but initial primate studies indicate safety and efficacy of DREADDs for modulating behavior and circuit activity (Eldridge et al., 2016; Grayson et al., 2016; Nagai et al., 2016; Upright et al., 2018). Indeed, the largest limitation to pursing this approach in the clinic may be determining circuits that, if successfully modulated, would treat chronic psychiatric disorders in humans. The present results illustrate that even selective circuit manipulations like those of DA neurons here can have nuanced, context-specific effects on behavior. Research was funded by Public Health Service Grants K99/R00-DA-035251, R01-DA-006214, P50-DA-015369, P50-DA-044118, F31-DA-036989, T32-DA-007288, R01-DA-033342A, F31-DA-042505, R01-DA-031900, and R01-DA-046476; a MUSC Department of Laboratory Animals Research Facilities Grant; and the Irvine Center for Addiction Neuroscience (University of California, Irvine). We thank Mitchell Farrell, Matthew Harberg, Hannah Schoch, and Phong Do for assistance with behavioral testing and Fos analysis; David Moorman, Elena Vazey, Morgan James, and Peter Kalivas for helpful comments; and the NIDA Drug Distribution Program and NIMH Drug Supply Program for providing CNO.